The vineyard owners believe in the environmental protection of the land and air associated with the vineyard. With that thought in mind, they have enrolled the vineyard in the LIVE Program which is a program designed to educate members about sustainable practices in the vineyard as well as in the winery. LIVE is an acronym for Low Input Viticulture and Enology and seeks to internationally standardize minimal uses of pesticides, water and fertilizer. Under this program, consideration has also been given to wildlife and natural habitat. 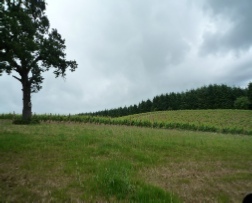 Each vineyard in the program agrees to sit aside a certain amount of land in the vineyard area for natural habitat. 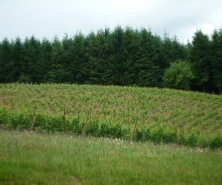 Technically, the soil of the Yamhill-Carlton AVA was described as Willakenzie, however the NRCS series (Natural Resource Conservation Service, established by congress in 1935 for the conservation of natural resources ) further divides the soil types found on our vineyard as Windygap, Bellpine and Willakenzie. 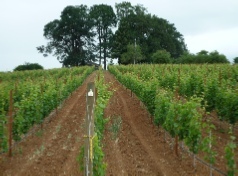 The AVA is blessed with a rain-shadow effect which somewhat protects it from rain during critical growing periods and allows complete ripening of the grapes. The effect of the soil and climatic conditions allow for the production of a dark purple-black grape packed with intense flavor. The vineyard has five different clones which provides the opportunity of blending to enhance balance and flavor in the wine.